My belly seemed to pop out overnight! All of a sudden I got huge! I think it's safe to say that I look like a pregnant lady now! Well I'm 18 weeks along and officially moved into maternity clothes in the past few days. 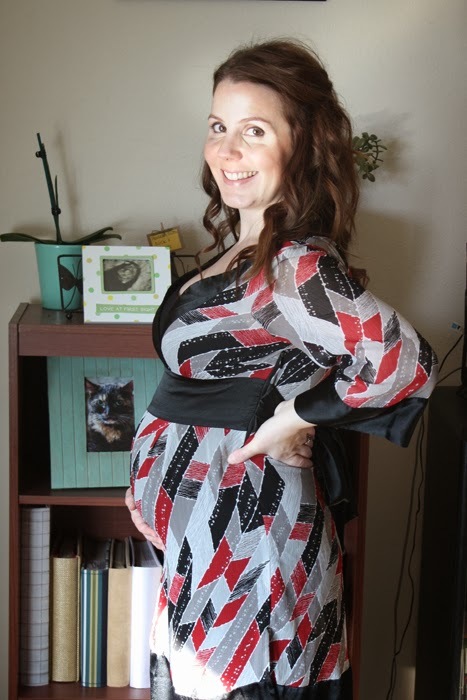 I've been wearing the maternity jeans with the full waistband for a while now, but to this point I've tried to squeeze my way into my regular size shirts and dresses. Unfortunately, my belly just won't do it anymore. 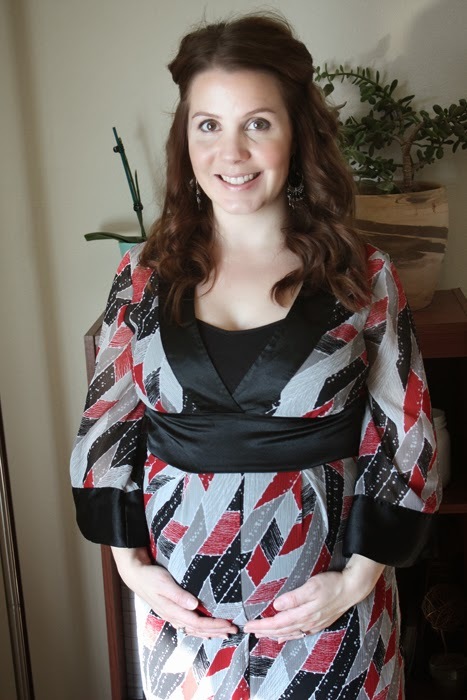 What really shocked me is that when I tried on a maternity t-shirt (the kind with the HUGE belly room), it fit me! I still have nearly 4 1/2 months to go! After being so sick my first trimester and feeling much better lately, I'm starting to enjoy my pregnancy. 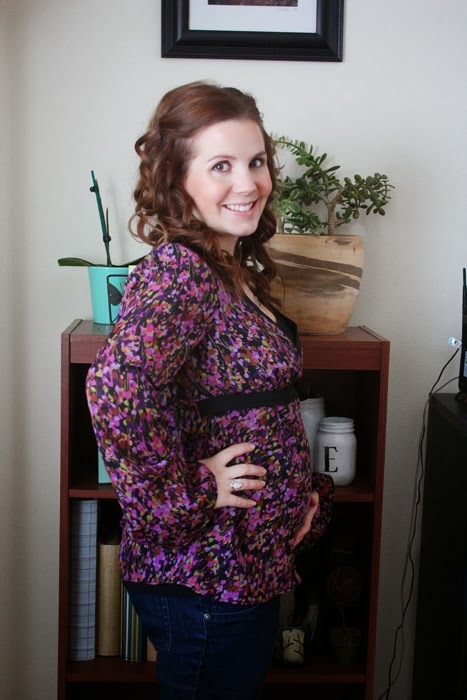 It was rough--and sometimes I still have days I'm not quite myself--but I love my growing baby bump! People are starting to really notice now, and I find myself talking to baby more and more! This weekend I will begin the LARGER-THAN-LIFE task of purging items in our house to make room for the baby's nursery! We have to clear out an entire room in the basement that we currently use as our storage/dumping ground. I'm NOT looking forward to it, but it must be done! We plan to have a garage sale this spring and donate whatever's leftover. Once we empty the storage room, we can move the spare bedroom to the basement and start filling the nursery! I'll post some before and after pictures when I get to that point. Wish me luck! Today we checked off my least favorite item from the pregnancy to-do list: daycare shopping. We toured daycare centers and aimed my list of a gazillion questions at the facilities' directors. After completely ruling out a few options, we signed up for the waiting list at the only center we felt even slightly comfortable with. 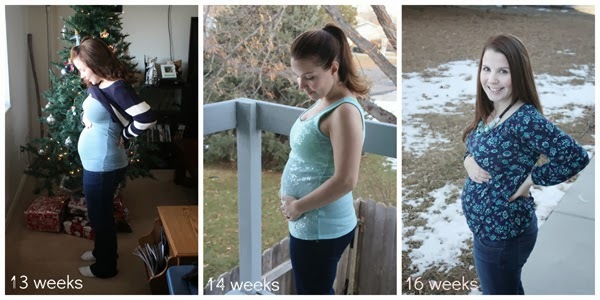 At 17 weeks pregnant, I'm not sure if I'll be returning to work full-time, part-time, or working from home after the baby is born. One thing I do know is that if I'll need full-time childcare, we should have started shopping weeks ago. Who knew that so few facilities would take babies less than 6 months old? Who knew it would be so hard to get into one that we'd have to get on a waiting list? My hope is that I won't be needing childcare, that I'll be home with my baby. But I'm glad to have this step out of the way. On another note, GO BRONCOS!!! We're so excited that our team is going to the Super Bowl this year! Woohoo! 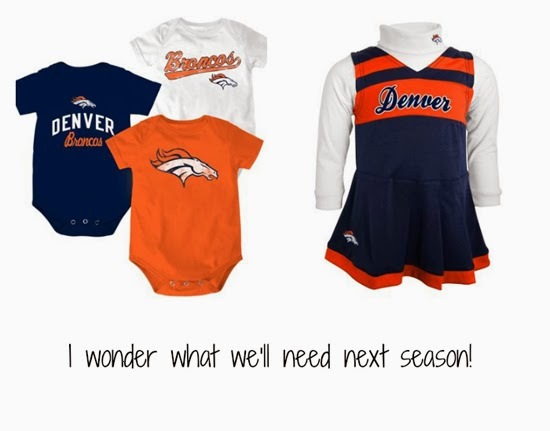 Find Broncos infant clothes here. Okay, I'll admit it. But ONLY because everyone keeps asking and pushing for an answer. But to be truthful, I really don't care if this bun turns out to be a boy or a girl--I will be equally thrilled with either! Nick and I both want to have at least one of each eventually. But I've been secretly wishing for a girl. (giggle!) Don't tell Nick! He's been wishing for a boy, only because in his mind, an older brother will look out for and protect a younger sister. But I grew up as the older sister, and I will argue that even younger brothers look out for older sisters. My brother Adam is 3 years younger than me. He and I fought like cats and dogs when we were children, but NOBODY else could mess with either one of us. The right to torture one of us belonged exclusively to the other, and if anyone else even tried, the other one of us stepped in. My younger brother truly was and is one of my best friends, and I'm glad I was the older one. I'm just so happy to be pregnant and carrying our child that either a little boy or little girl will make my heart burst with joy! 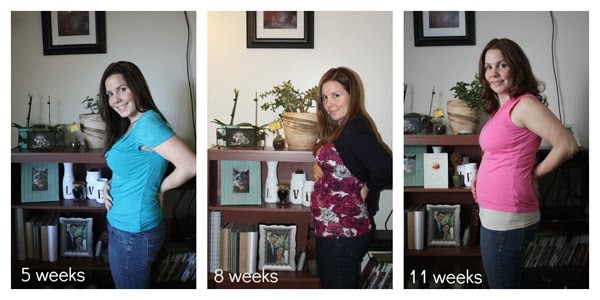 Here's the progress of my baby bump pics, for those of you who don't have Facebook to see how my shape has changed. We'll find out the gender in early February, but we're not sure if we're going to share right away or if we'll have a gender reveal of some sort. Stay tuned! And if you think you know baby's name--guess again! We've actually scrapped the names we started with and are starting over after we find out the gender. But we're not telling until baby is born. It will be a surprise! By the way, you may have noticed that this is a whole new URL and blog site. I did this for 2 reasons. One, my old blog site got some sort of glitch and it kept deleting parts of the template. Two, someone got a hold of my old email through that blog and started bombarding me with emails, trying to give me a virus. So the old site is gone. I'm sorry for those who were subscribed--I know it's annoying to have to subscribe again, but here it is. Feel free to sign up on the right side of this page.